Here’s a snappy, crisp, and refreshing summer salad which can become a main course with the optional addition of some protein (I used sliced hard-cooked eggs, but you could use whatever you like, such as sliced grilled chicken or shrimp, or even marinated, grilled tofu). I used a spiralizer to make the “zoodles” (zucchini noodles), but you can also use a vegetable peeler to make long, fettucine-like ribbons of zucchini. 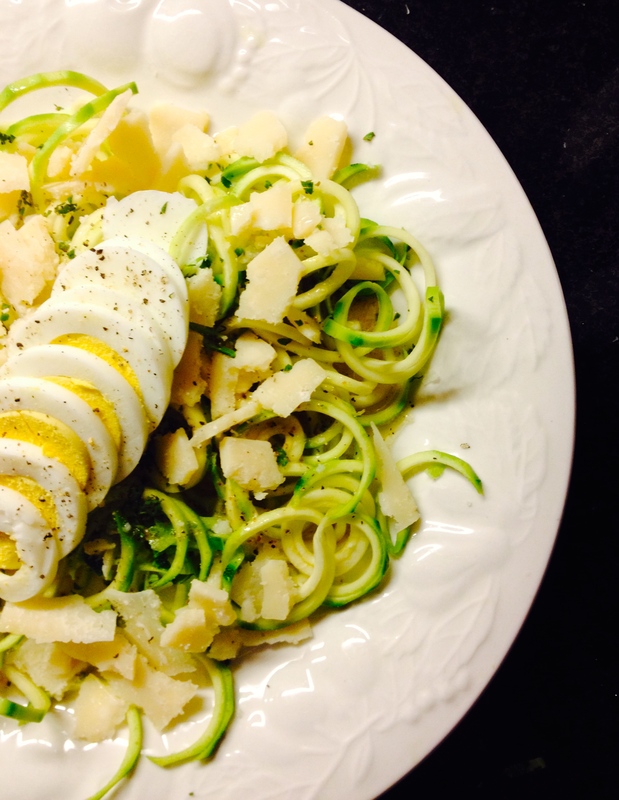 Once you get started with zoodles, it’s kind of hard to stop. You’ll think of all kinds of dressings and toppings and sauces to put on them. This is the time of year when zucchini is abundant, so knock yourself out! Confession: I wasn’t even sure if I liked zucchini due to a watery experience with cooked zucchini in my childhood, but prepared raw this way, it’s crisp and fresh-tasting. Make the “zoodles”: Use your spiralizer on the small setting (or whatever you prefer) to make spiralized zoodles, or use a vegetable peeler to make long ribbons of zucchini. (I don’t have a cute name for these though. Zibbons?) Arrange on two dinner plates. Sprinkle each with a pinch of sea salt and a couple twists of freshly ground pepper. Assemble the dish: Drizzle the dressing over your plated zoodles. Arrange Parmesan shards or diced feta to taste. If using eggs, arrange sliced eggs prettily over the top, and sprinkle them with a little more salt and pepper. Enjoy!